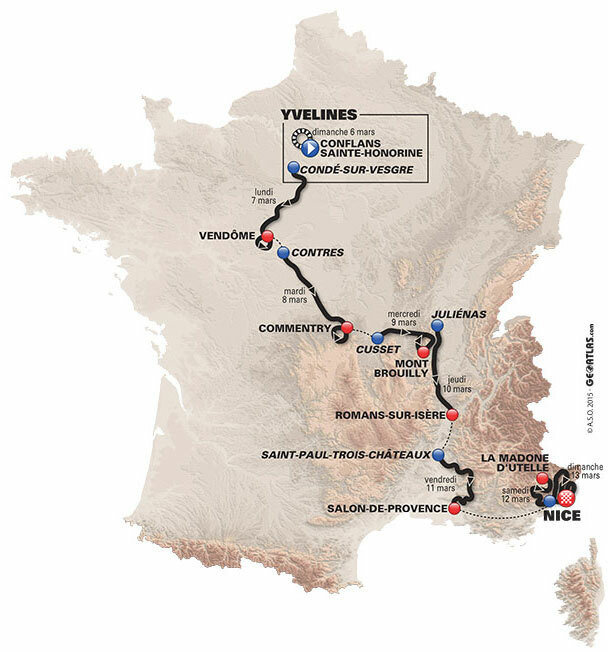 Stage five will take the riders up the Madeleine and Mont Ventoux (to the Chalet Reynard on the south face of the mountain, @ 1,440 meters). Alberto Contador, Peter Sagan and Rafal Majka took to the stage at the packed Courchevel ice rink during the bib draw of the Audi Fis Ski World Cup - Ladies Alpine competition to present the highly-anticipated race kit for the 2016 season. Contador, Sagan and Majka stole the show in Courchevel as they rode their bikes on the ice rink, in front of thousands of ski fans, to the central stage where they addressed the crowds and unveiled the team's 2016 race kits. Our three stars were joined on the stage by team owner, Oleg Tinkov, Managing Director, Stefano Feltrin, Head Sport Director, Steven de Jongh and Technical Coordinator, Ivan Basso. The race kit Tinkoff riders will don in 2016 incorporates the state-of-the-art BodyFit technology by Sportful and doesn't break with the recent past, following instead an evolution of its yellow and blue colors, with minor design tweaks. The team's signature fluo yellow takes a more prominent position on the jersey as does the name of the 2016 naming sponsor, Tinkoff Bank. Being the largest purely online bank in the world by the number of clients, Tinkoff Bank is now working on becoming a universal financial marketplace with a focus on mobile services. The Tinkoff crest now takes center stage, at the front and back of the jersey. The most marked color change takes place on the shorts where gray-blue becomes predominant and yellow is present in the form of a stripe at the bottom of the thigh. Peter Sagan, unveiled his eagerly-anticipated World Champion kit, wearing the white rainbow jersey and black shorts with the rainbow bands at the bottom of the thigh. 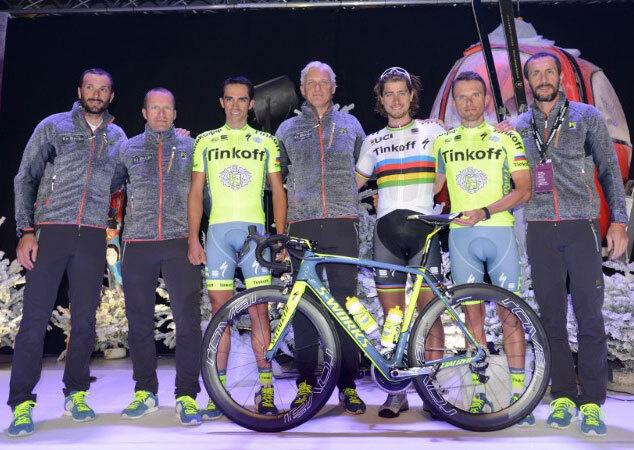 According to Stefano Feltrin, "this presentation marks the start of the 2016 for Tinkoff. With some of the world's best riders in our team we have a challenging but ambitious year ahead of us. Alberto, Peter and Rafal will tackle the world's most prestigious races and thanks to Sportful, they will do it in clothing that combine style and performance". “Sportful are excited to continue our work with Tinkoff as we head into the 2016 race calendar. Our partnership with the team allows us to develop some of the most technical clothing in the peloton, finding new ways to make Tinkoff riders the best equipped for every weather condition and every race", commented Glen McKibben, Brand Manager at Sportful. "The team has been vital in helping us to continue to provide innovative technical cycling apparel and we are proud to contribute to the continued success Tinkoff”, concluded McKibben. MONTREAL (BRAIN) — Custom framebuilder Guru Cycles sent a letter to dealers this week announcing that the company is going through restructuring. Guru's Ted Matthews and VP of sales Robert Pinazza declined to comment on the letter or the restructuring on Wednesday afternoon. The letter pointed to the company’s relocation over the summer, which was “extremely costly,” took longer than expected, and impacted manufacturing. Guru previously was headquartered in a 25,000-square-foot facility that housed its factory and offices in Laval, a suburb of Montreal. Guru made some 1,500 custom steel, titanium and carbon road and triathlon frames out of that Montreal factory, though in recent years the company began importing some Asian-made carbon frames, especially of stock sizes. The company offered custom frame geometry and tube diameters as well as personalized paint and finishes with a turnaround of four to five weeks. A year ago, Matthews told BRAIN the goal was to double the volume of manufacturing at the facility and the company launched a campagin in late 2014 to grow the number of Guru dealers. Guru is offering dealers a select number of frames at reduced prices in an effort to reduce inventory and improve cashflow, the letter said. Here's the rest of the story in Bicycle Retailer. BMC Racing Team President/General Manager Jim Ochowicz today announced the signing of Klaas Lodewyck as Sport Director for BMC Development Team in 2016. 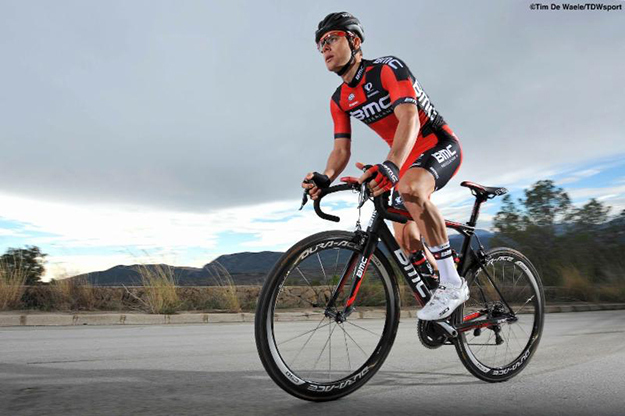 Lodewyck, 27, was a member of the BMC Racing Team roster in 2015 until a medical issue forced him to retire in August. “The opportunity for us to bring him to the team, in a Sport Director capacity for BMC Development Team was a great opportunity, not only for him, but also for us. We are very happy to see Klaas make this transition, whilst still remaining within the BMC family” said Ochowicz. BMC Development Team Manager Jens Blatter welcomed Lodewyck into the team. “I’m proud to work with our Development Team, made up of talented riders from all over the world. I’m very happy that the team management found a young and motivated Sport Director in Klaas Lodewyck and I’m sure he will be the right person to join BMC Development Team”. BMC Development Team’s 2016 roster will comprise 16 riders from seven countries, including ten new signings for the season. In keeping with BMC Racing Team policy, no other terms or conditions of the contract were released. Riders continuing from 2015: Eisenhart, Taylor (USA), Kilian Frankiny (SUI), Müller, Patrick (SUI), Spengler, Lukas (SUI), Tietema, Bas (NDL), Van Hooydonck, Nathan (BEL). New riders from 2016: Appelt, Leo (GER), Dobbs, Sam (NZL), Eenkhoorn, Pascal (NDL), Lienhard, Fabian (SUI), Mostov, Ezekiel (USA), Spengler, Mario (SUI), Schäppi, Martin (SUI), Sivakov, Pavel (RUS/FRA), Swirbul, Keegan (USA), Welten, Bram (NDL).